Winter can be a frustrating time at an astronomical observatory with the presence of dark threatening clouds, freezing temperatures, high humidity, blustery winds, and blowing snow. 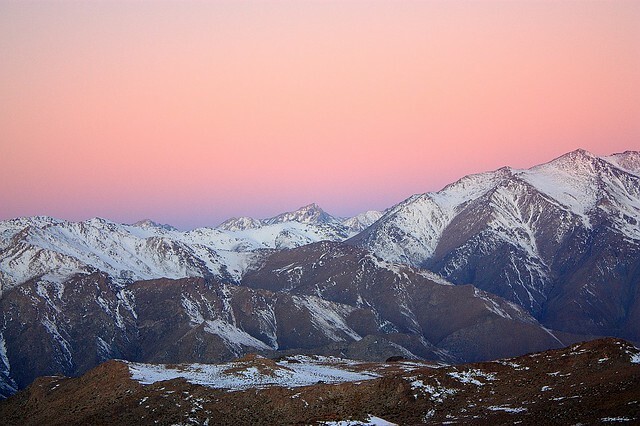 With a month remaining in the Chilean southern winter and the forecast for clearing skies, the nighttime-observing crew arrived tonight (28 Aug 2011) at the Cerro Pachón summit with the following view towards the Andean spine to the east, and the setting sun behind us to the west. View from Cerro Pachón, Chile – 28 August 2011. 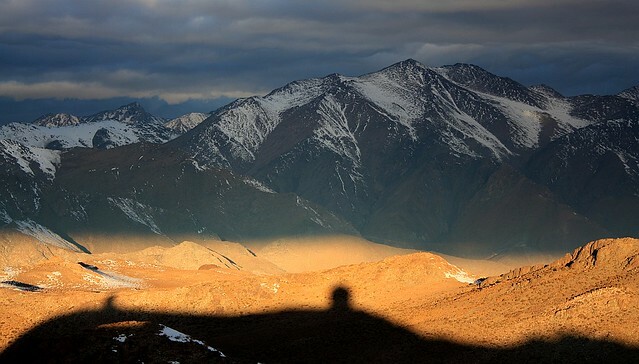 This photo was taken at an altitude of about 2700 metres (8860 feet) above sea-level. The dome-shadow at lower-centre is Gemini Observatory (South); I stood in its shadow at the edge of the ridge where I made this photograph. The dome-shadow at the lower-left is the SOAR Telescope. View from Cerro Pachón, Chile – 24 July 2011. The view sure is pretty up here. At the centre of the photo above, the background ‘peak’ marked by the red pin (in the Google map below) is 4450 metres high (14600 feet) with a line-of-sight distance of 32 km (20 miles) to the east southeast (heading 96 degrees). Over to the right of the photo, the foreground ‘peak’ marked by the green pin is 4340 metres high (14200 feet) with a line-of-sight distance 19 km (12 miles) to the east southeast (heading 106 degrees). The location of Cerro Pachón is marked by the blue pin below. After 15 years in the business, it’s a little difficult to imagine (but getting easier to accept) that I’m packing it in by the end of this year for something new and different. This post was published originally on Fotoeins Fotopress (fotoeins.com). That sunset photo is awesome! I love the colors. It gives off a really mellow feeling even though from your description it sounds like a harsh place to be. I am so glad you are writing about Chile! Love these!